About a decade back, this discussion about women bosses in the Indian workforce may have been irrelevant. Today, India Inc has woken up to a surreal surge of women executives taking reigns of companies, departments and organizations and are slowing clawing back on the apparent gender gap that has been the buzz for many years. Let’s take a look at what some of the ladies in the top brass had to say when ET quizzed them about the secret to their climb up the corporate ladder. 2 Are women born multi-taskers? 4 Is India Inc witnessing a change in attitude towards women leaders? One of the reasons why women are surging forward could be because of the simple fact that they perceive the concept of gender as something that is simply incidental. In no way does this mean to label men as chauvinistic in the 21st century. But the fact the gender itself is a nonchalant issue for women, could add a touch of stability to their management style. As Padmaja Alaganandan, Executive Director Consulting PWC, puts it "Gender? For 20 years of my career, I have not approached the topic as something that matters." Traditionally for women, work-life balance is just not as simple as managing work and personal life. Elements like family, chores, kids and many other aspects of being a nurturing figure come into play. This makes us wonder if multi-tasking, a skill which is highly desired in the corporate world, is actually an inbred and nurtured talent that women bosses posses. Besides chores and responsibilities of a household, women are also seen playing peacemakers. It’s really no surprise when Roopa Kudva, MD & CEO Crisil says "Some of these competencies come naturally to women: strong communication, running multiple agendas simultaneously, dealing with ambiguities and differences" when talking about managing multiple variables in the workplace. Is India Inc witnessing a change in attitude towards women leaders? "The first generation of women at the workplace had it a bit tough. The 20-something’s of today will have it much easier because the women in their 30s are already reporting more openness to their leadership" said Ketaki Gupte, founder of Reflexion. Does this imply that India Inc. is trending towards incorporating a higher strength of women managers in the workforce? About the same time last year, IE reported a study by Industry body Asscoham which said the emergence and growth of the service industry has seen an increase in the number of female employees and women managers, especially in the private sector. In terms of the percentage of women in executive positions, the same study reveals that there is still a lot of catching up for women managers to be done. However, India Inc may very well have now become open to women leaders in the workforce. Naveen Puri, Assistant VP of Genpact spoke about his feelings when Vidya Srinivasan was becoming his new boss, heading an infrastructure giant in India "Her collaborative techniques and mentoring have been more effective than any male boss. She doesn’t sugar-coat critical feedback which helps improve work quality" he said. How Twitter Can Get Back its Mojo! 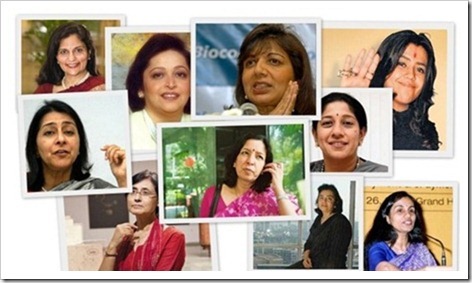 5 qualities of top women in Indian corporates!